My finished look! Notice the three colors blended on the eyes. Sure we've all seen the colorful swirls on airbrushed t-shirts and hats but using airbrushing technology for make up was a totally new one for me. Dinair, the leading company for airbrush make-up, had a massive booth at Premiere Orlando jammed packed with people being made over by gun wielding make up artists — airbrush guns, that is. I stopped by to check out the scene and inquire exactly why I should swap my make up brushes for a machine. The answer: total coverage that lasts 16-18 hours and because the product is aerated, it goes on super smooth and is not at all heavy. As I watched all of these ladies (and gents!) leave the booth with flawlessly finished make up, I decided that I needed to go under the gun. The make up artist had me remove all traces of make up I had arrived with. I'm not much of a foundation wearer but in the interest of having the full airbrush experience, I decided to have it all done from foundation to my brows. As she swept the cocoa-toned spray over my cheeks and forehead, all I could feel was a blast of light, cool, wet air as the product settled on to my skin. Once my foundation was set, she asked me if I wanted to go more natural or more dramatic with my eyes. Again, in the interest of seeing just what airbrushing could do, I opted for the high-drama route. Selecting an orange and a purple to match my dress, she swept the gun daintily over my lids. I kept wanted to open my eyes and peer into the mirror to see what was happening but kept them closed for fear of winding up with a purple-coated contact lens. 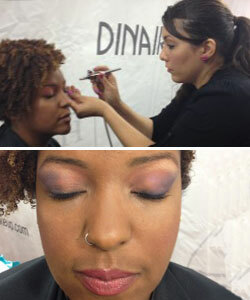 After my eyes, she used a stencil guide to airbrush on my blush and define my cheekbones. She ended by spraying a coat of black along my upper lashes, because YES you can airbrush on your mascara too! The entire process took about 10 minutes total and I was totally impressed with how much control the airbrush offered in terms of contouring and definition. I learned that airbrush make up isn't just for faces and can be used on the body to apply temporary tattoos-or even cover up existing tattoos! 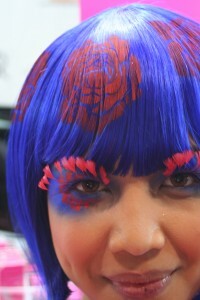 You can even use it with a stencil to apply a a hair tattoo or free form to add pops of color. The full airbrush set up and color options. 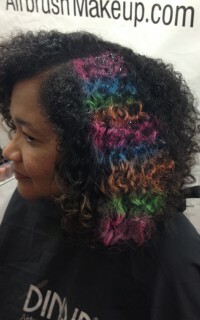 Airbrushed curls! Look at how vibrant the colors are. Airbrushing?! More like HAIRbrushing. Check out these stenciled airbrushed hair tattoos. Overall, I thought airbrush make up was a totally novel make over experience that offers a great way to get not only quick and easy coverage but also gorgeously contoured shading and color blends. 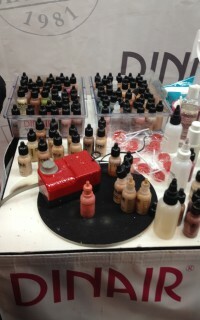 Airbrush make up set ups are not just for professionals and can be used at home. My make up artist told me that she uses her airbrush to apply her make up every morning. What do you think? Have you tried airbrush make up before? Tell us about your experience.